Rich in nature, people, and history, Point Loma is one of the oldest communities of San Diego and one of the area's most-visited neighborhoods, featuring some of the best activities and outdoor adventures around. With spectacular views of the Pacific Ocean, the San Diego Bay, the downtown skyline, and Coronado, the sights in Point Loma are unparalleled. 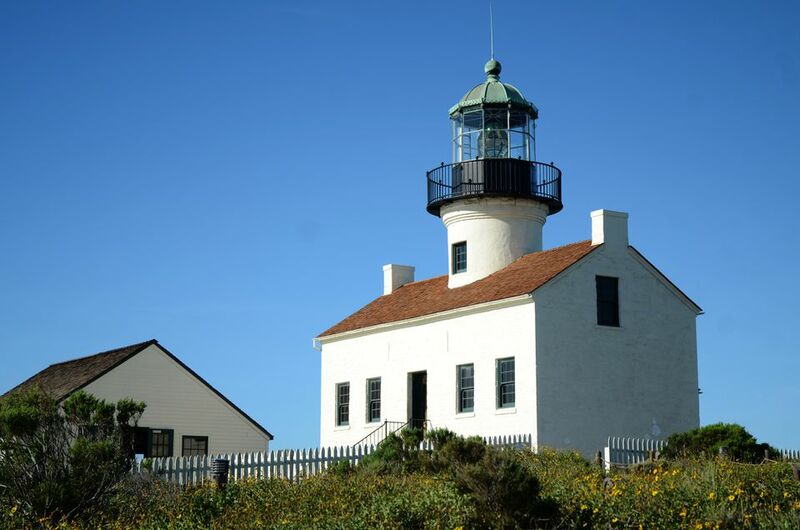 However, there's more to do and see than just gorgeous views, including some popular and lesser-known activities like the Lighthouse or the Fort Rosecrans Cemetary. Whether you prefer active adventures or quietly discovering the history and culture of the region, there's plenty to do and see on your trip to San Diego, especially if you visit the Point Loma neighborhood. The central feature of Cabrillo National Monument atop the Point Loma Peninsula is the Old Point Loma Lighthouse, which was erected by the U.S. Government in 1855. According to the San Diego Historical Society, the old lighthouse is 510 feet above the sea, the highest lighthouse in the world, and remained the loftiest still operating in the United States until 1891, when it was discontinued in favor of a new, lower lighthouse closer to the shoreline. This was necessary because it had been so high it could not be seen by incoming vessels in foggy weather or when low clouds obscured it. Though the lighthouse has long been discontinued, the building has been restored and is now a museum and a beloved landmark of San Diego, where millions of visitors take in the spectacular, panoramic view of the city and ocean on clear days. Because of their protected status, some of the best tidepools in California can be found right at Cabrillo National Monument. On the western side of Point Loma lies the rocky intertidal zone, a window into the ocean ecosystem that lies along San Diego's coast, and during low tide, pools form along this shore in rocky depressions. The Point Loma tide pools are one of the great natural wonders of the San Diego area and are a fun way to introduce kids to sea life in an entirely natural habitat. It's also a great way to show children and adults how fragile and vital this ecosystem can be. As the name might suggest, Sunset Cliffs is the ideal place just to sit and watch the sunset. The sandstone cliffs and crashing waves below make for a setting found in very few places around the world. Just south of Ocean Beach and on the west side of the Point Loma peninsula, Sunset Cliffs isn't a sandy stretch of beach for frolicking, though it is a favorite spot for surfers willing to make their way down the slippery rocks to catch waves. Since it's connected to the mainland by a narrow strip of land, Shelter Island is technically an isthmus, but it's also the most popular neighborhood of Point Loma for tourists and locals alike to enjoy recreational activities and outdoor fun. There are tourist-oriented, Polynesian-themed hotels and a very busy public boat launch where local boat owners head out for a day of sailing or deep-sea fishing. There are also relaxing picnic areas along Shoreline Park where you can enjoy the spectacular skyline view. Shelter Island is also home to a favorite fishing pier, where locals cast their lines and luck, hoping for a big bite. Of all San Diego's beach communities, perhaps none exemplify the community and neighborhood ethos better than Ocean Beach (commonly referred to as OB). Some might argue that Ocean Beach is not part of Point Loma, but geographically it anchors the northwest portion of the peninsula. This funky beach town sits between the Pacific Ocean to the west and the more upscale enclave of Point Loma on the hill to the east. It's laid back and less rowdy than its brethren Mission Beach and Pacific Beach a few miles north. Where other beach communities have embraced commercialism, Ocean Beach remains fiercely independent and skeptical of wholesale change. Ocean Beach is fondly looked upon as the neighborhood that time forgot and it still has that hippie vibe, a carryover from the 1960s and 70s that never really left. This is what makes OB popular with a variety of residents—from surfers to students to families. Formerly the site of San Diego's Naval Training Center, Liberty Station is rich in history and culture with unique museums and historic buildings. What makes it unique is that the sprawling property has been transformed into a planned urban residential community with mixed-use retail, commercial and cultural tenants incorporated into many of the preserved historical buildings. Liberty Station also has an expansive 46-acre green space that fronts the boat channel, making it a great place to explore, stroll, shop, dine and play—right in the middle of the city. This funky little nine-hole golf course is a remnant of the old Naval Training Center and survived the property's transformation into Liberty Station. Sail Ho is one of the oldest courses in the county, having been around since the 1920s. Located at the north end of Liberty Station, the new and improved Sail Ho Golf Club features redesigned fairways, greens, and practice facilities designed by renowned San Diego architect Cary Bickler. Even though Point Loma and the surrounding area has a prominent military presence (Fort Rosecrans Cemetery, Naval Submarine Base), many people don't realize that Point Loma was a major military outpost during wartime because the Point Loma peninsula forms a natural protective barrier at the entrance to San Diego Bay, rising 422 feet to provide strategic views of the harbor and ocean. During World War I and II, military facilities on the Point provided vital coastal and harbor defense systems. Between 1918 and 1943, the Army constructed searchlight bunkers, fire control stations, and gun batteries. Along the paths of Cabrillo National Monument sit the remains of coastal defenses built to protect the approaches to San Diego Bay. While visiting the park, you will find base-end stations, fire control stations, searchlight bunkers, a radio station which now houses an exhibit, and other remains of wartime. It's probably the one place on Point Loma that most San Diegans haven't ever set foot upon, much less even know about. However, Point Loma Nazarene University (PLNU) is arguably the most picturesque college campus in San Diego. The 2,000-student PLNU sits on the bluffs overlooking the Pacific Ocean. Before PLNU moved to this site in 1973, the campus site in what's known as the Lomaland area of Point Loma was home to California Western University. Before then, the site had some academic buildings in place, including the Greek Amphitheater, which was the first built in North America in 1901. As you drive along the Cabrillo Memorial Drive heading towards Cabrillo National Monument, you'll notice a grave site of thousands of identical headstones all in uniform rows. This is Fort Rosecrans National Cemetery, which was once known as the Bennington National Cemetery before the Veterans Administration National Cemetery System took it over in 1973. A burial ground before 1847, this graveyard became an Army Post cemetery in the 1860s. It is the final resting place for most who fell at San Pasqual in 1846 and for the USS Bennington victims of 1905. At one time, it had been known as Bennington National Cemetery. It's a solemn memorial for those who served this country and is a tranquil setting to reflect.